By the end of Season One of the Flash, it’s now evident that Dr. Wells is the Reverse-Flash who is back from the future and who is also the killer of Barry’s Mom. Now, even though Dr. Wells is in captivity, he offers Barry an option: assist the doctor to get back to the future and in return, save his mother’s Life. Now, given that time travel has been a big part of the show, one wonders whether it follows the causal loop or multiverse theory. And the answer to which is the multiverse theory since the actions taken does have consequences. Of course, in the episode, there is a lot of questions about what will happen if his mother is saved especially from his Dad. Which causes Barry to think about the time that he would lose and that he spent with both Joe and Iris since childhood. One thing that was really annoying was the way the episode began with way too much exposition that doesn’t give the viewers anything at all. If that’s not enough, it takes entirely too long to reach the action part and even then Barry is still not able to save his mother. And as for the episode’s anti-climax involving the ‘black hole’, Barry’s attempt to unwind is purposefully left to be concluded next season. However, it doesn’t look likely that the entire world could face destruction so soon. Having said that, the episode was nice for the emotional interactions that Barry has with his mother and father is memorable. What is also surprising is what happens to Cisco who was apparently affected by the particle accelerator too. However, the most important character of the show is definitely Eddie who, in shooting himself, prevents the possibility of Dr. Wells from existing since he is an ancestor. 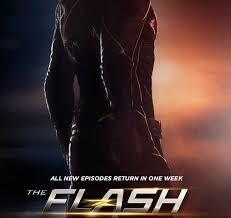 No matter how you see it, he is the real hero of this Flash episode – not the Flash as we would like to have it.